Look What San Diego is Doing! 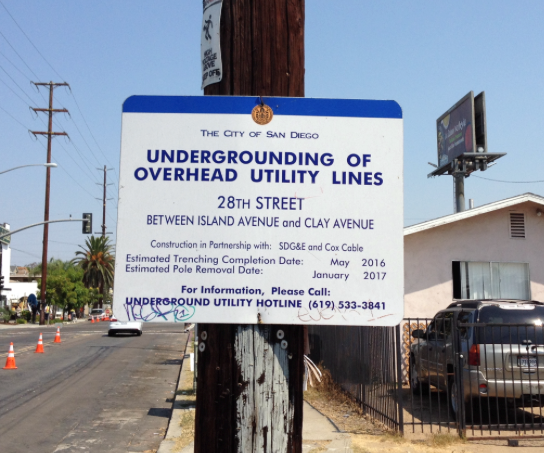 The city of San Diego has in progress a Utilities Undergrounding Program, currently relocating approximately 15 miles of overhead utility lines underground throughout the city each year. The program is funded primarily through a 2003 California Public Utilities Commission approved undergrounding surcharge of 3.88% on San Diego residents’ electricity bills. SFCUU members Steven Edwards and Randall Brubaker were recently welcomed to a visit in San Diego with James Nabong, Utility Undergrounding Program Manager, City of San Diego. Among other subjects discussed, Mr. Nabong reacted positively to our suggestion that a representative of the City of San Francisco might some day wish to also visit San Diego, to benefit from the experience and knowledge on this subject that now exists there. 1. Undergrounding work in San Diego is now being done by private contractors other than San Diego Gas and Electric. They are putting the work out for bid by qualified contractors. 2. The contractors doing the work are using both trenching and directional boring (trench-less technology). They are experts at both techniques, and use the most appropriate method in each project. 3. San Diego is in progress of refining their master plan from what they have learned since this program began about 12 years ago. Mr. Nabong offered that they would be willing to share with us what they have learned. This is a fantastic opportunity for San Francisco to benefit from the experience of another city. Hopefully our city will take advantage of this! Directional Boring – FOR BEER!!! It may not actually be necessary to dig trenches everywhere on streets to be undergrounded. A technology known as “directional boring” or “trenchless technology” is in use in many places in the world to put pipes, wires, etc. underground with minimum disturbance to the street surface. Here is an example where a pipeline for BEER is being put underground using such technology.